Kenshine Group has a well established global freight forwarding network offering single source solutions to mange freight and transport needs. We have a highly dedicated, smart and hard working team providing clients with the expertise and know-how supervising all aspect of operations with the passion and professionalism. 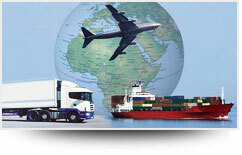 With our decades of experience in the field of Freight forwarding and the advantage of vast agent network of air, ocean, rail or road transport facilities, Kenshine Group has established itself as a preferred Freight forwarder for a host of Industries which include Ship Building, Hotels, Engineering, Plant & Machinery, Chemical, Pharmaceuticals, Developers & Realty companies engaged in building Mega Commercial & Residential Projects, companies dealing in Kitchen and Bath Plumping Fixtures, Furniture, Marble & Tile, Generators, Elevators, Escalators, Golf & Resorts etc. Our own Custom Clearance License registered at all branch locations. Ability to offer customised solutions based on individual customer requirements. Presence in co-related activities by partner companies, i.e. Shipping, Warehousing, etc.